Hyman Bress was a Canadian violinist born (in Cape Town, South Africa) on June 30, 1931 (Heifetz was 30 years old.) He is known for having recorded the violin concertos of Joseph Joachim and Ernest Bloch, probably the first to do so, among many other obscure works. He was also the first violinist of the Montreal String Quartet in its third incarnation in 1955. It was composed of Hyman Bress, Mildred Goodman, Otto Joachim, and Walter Joachim (cellist and brother of Otto Joachim, violist.) In fact, on May 21, 1956, the quartet played the premiere of Canadian pianist Glenn Gould’s string quartet (Gould’s Opus 1), a work that has kindly been described as being serious and pensive. Bress later recorded a series of five records for Folkways Records entitled The Violin. (Folkways is a special project of the Smithsonian Institution.) The series covered material from the Baroque to the Twentieth Century (1960s) and included one of his own electronic compositions – the Fantasy for Violin, Piano, and electric tape. (One of the pieces recorded in this series is the Sarasate Zapateado played at the fastest tempo I have ever heard.) He first studied with his father and gave his first public performance in Cape Town (South Africa) at age nine with the Cape Town Municipal Orchestra. After that debut, he performed throughout South Africa for a time. In 1946, at age 15, he began studying with Ivan Galamian at the Curtis Institute (Philadelphia) and continued with Galamian until 1951. In 1951, he moved to Canada and established himself in Montreal, giving recitals and playing in radio as well (mostly for the CBC.) He performed regularly there, in the U.S., and in Europe, eventually founding the Montreal String Quartet in Canada with the Joachim brothers. He became concertmaster, at age 27, of the Montreal Symphony for one season (1958-59) then continued his concertizing career as a soloist, often with major orchestras like the Berlin Philharmonic and the London Symphony. He first appeared with the Berlin Philharmonic on April 1, 1968, playing a work by Boris Blacher. Reinhard Peters was on the podium. (Bress was never a guest artist with the New York Philharmonic.) He also continued playing with the quartet (until 1963.) 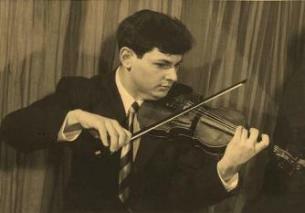 A Canadian newspaper reported that in 1966, Bress became the first Canadian violinist to tour Russia, though it seems unlikely. In 1973 he toured the Far East. He settled in Europe for a time but returned to Canada in the 1980s. By this time, he was no longer playing, being prevented by what has been called mental illness. He was 55 years old. Bress premiered several works which are no longer heard and will most likely not be heard again for some time, including Violet Archer’s violin concerto, Udo Kasemets’ concerto, and Kelsey Jones’ Introduction and Fugue. In New York, he presented his Fantasy in 1962 (or thereabout) while the score of the piece was being shown on a large screen as it was being played – one of the first instances of a multi-media concert presentation. YouTube has a sound recording of his – the Tchaikovsky concerto – which you can listen to by pressing here. His recordings are not hard to find on the internet. Hyman Bress died on October 30, 1995, in Montreal, largely forgotten, at age 64.